Atlanta Falcons quarterback Matt Ryan is playing up to his NFL MVP standards established when he won the trophy two seasons ago. Eli Manning, four years older than Ryan at 37, hasn't come close to matching the play or production that made him Super Bowl MVP on two title-winning teams for the New York Giants. The two veterans, polar opposites in their play so far this season, will be the main storylines as the injury-riddled Falcons (2-4) host the controversy-plagued Giants (1-5) in a "Monday Night Football" matchup at Mercedes-Benz Stadium that looked a lot more consequential when put on the schedule. Ryan's strong play hasn't been enough to cover for a defense that is missing three of his top players. Manning, meanwhile, has shown that his productivity may at the end and that the Giants' likely made a mistake by not drafting a successor despite the success of rookie running back Saquon Barkley. Odell Beckham Jr. pointed the figure at Manning in an ESPN interview after a 34-13 to Philadelphia a week ago Thursday and the Giants have been on damage control since, with co-owner John Mara saying that his star wide receiver "needs to do a little more playing and a little less talking." Pat Shurmur is sticking with Manning despite the quarterback's lack of arm strength and mobility to fully take advantage of Beckham. "We believe in Eli," the first-year coach said. "My confidence in myself is good. I know I can play," said Manning, who holds the franchise's career records for passing yards, touchdown passes and completions. "I just have to figure out how to be more consistent and be better on offense." Manning will get tight end Evan Engram back and Barkley should be able to exploit the Falcons' tackling issues, but can the Giants outscore Ryan even though kicker Matt Bryant is out at least until November because of a hamstring strain and running back Devonta Freeman had to go on IR with a sports hernia that required surgery. "We are hopeful he will be able to return this season, but we will have a better feel for that in the coming weeks," Falcons coach Dan Quinn said of his two-time Pro Bowler. 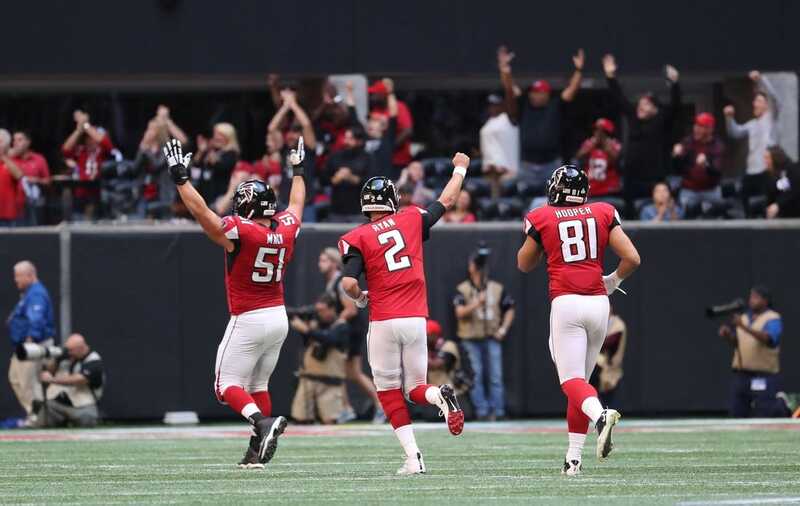 The Falcons beat Tampa Bay 34-29 last Sunday as Ryan continued to put up wild numbers despite the absence of wide receiver Calvin Ridley and Mohamed Sanu for part of the game. Ryan has 13 touchdown passes to one interception in four home games while posting a 134.3 quarterback rating. Overall, he is fourth in the NFL at 113.6. Manning, in contrast, had a QB rating of 66.1 against Philadelphia and has just six touchdown passes while being sacked 20 times. The Giants and Falcons have split their 24 previous meetings, including one in the playoffs. Atlanta scored two fourth-quarter touchdowns to win 24-20 on the road in September of 2015 in the most recent meeting. The Falcons hope to have rookie Ridley, who has six TD catches, and Sanu ready to face the Giants. Giorgio Tavecchio was signed to fill in for Bryant.